Boston — In the wake of tightening municipal budgets, environmental violations, and aging infrastructure, private players are poised to capitalize on struggling water and wastewater utilities. According to a new report, U.S. Municipal Water & Wastewater: Defining the Addressable Market for Private Investment, Bluefield Research estimates the total market value of more than 78,000 community water and wastewater systems across the U.S. to be more than $728 billion. Approximately 15% of community water systems are already owned by private players, including investor-owned utilities and in the first half of 2017, Bluefield has tracked more than US$224 million of investor-owned utility acquisitions across 53 deals. The most notable transaction by an industry outsider, which is still pending, was Eversource’s $1.68 billion takeover of Aquarion. Given the geographic and customer overlap of electricity, gas, and water, Eversource anticipates benefitting from synergies in billing, regulatory, and branding. Public water systems face environmental violations, financial burdens: Approximately 5,300 municipal and private drinking and wastewater systems in the U.S. are listed as significant regulatory violators. “Serious system violations” is the most significant level of U.S. EPA violation designation and indicate an immediate need for infrastructure investment. Climbing residential water rates are adding pressure to utilities: Adjusting for inflation, the combined water and wastewater bill for a typical U.S. household has increased 18.5% since 2012, or 4.4% per year on average. This rise is attributed to growing populations, more efficient water usage, and aging systems networks, all of which pressure municipal and utility budgets. Federal funding for water infrastructure has decreased: Federal funding for water utilities peaked in 1976 at US$16.9 billion and has since fallen to US$4.3 billion in 2014, passing the financial burden to states and municipalities. A primary resource continues to be the EPA managed State Revolving Funds, which totaled more than US$12.7 billion in 2016-2017 for drinking water and clean water projects across all 50 states. States are encouraging private investment in public water systems: Since 2013, five states- Missouri, Illinois, New Jersey, Indiana, Pennsylvania have joined California in facilitating private investment with fair market value (FMV) legislation. 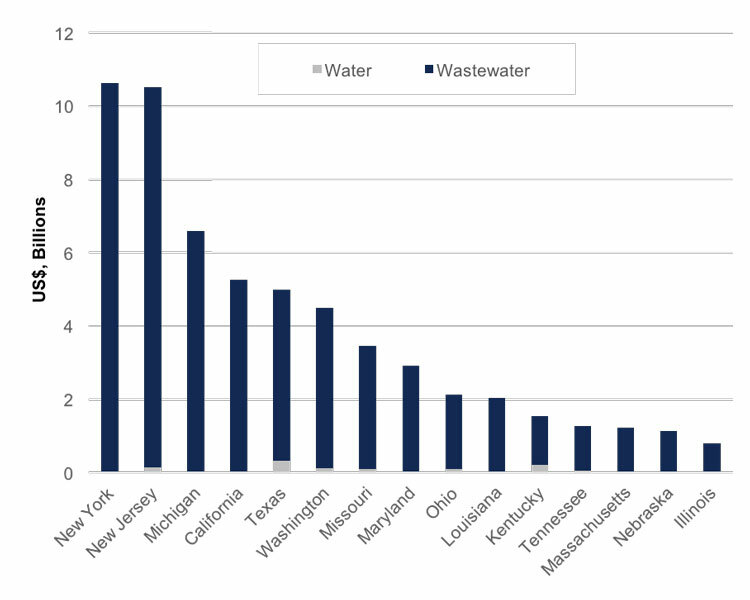 The Mid-Atlantic region hosts the greatest private ownership presence in water systems. Texas and Pennsylvania are hot spots for acquisitions with 90 pending and completed deals in 2017. M&A is not the only approach being considered to resolve America’s water and wastewater infrastructure woes. Public private partnerships, including third-party operation & maintenance contracts, and concessions represent other options. These deals have been slow to gain momentum largely because of local resistance, despite readily available access to capital.